Cuatro Ciénegas (“Four Marshes”) is a city and municipality in the northern border state of Coahuila. Founded in 1800, it has some historical significance, since it was the birthplace of Venustiano Carranza, Mexico’s president from 1915 to 1920. The natural nearby “marshes” are highly unusual. Situated in an arid region (part of the Chihuahuan desert), they include several natural springs that feed more than 200 small ponds and wetlands. Some of the water supporting these unique wetlands, which cover an area of 84,400 hectares, is believed to be more than 200 million years old. 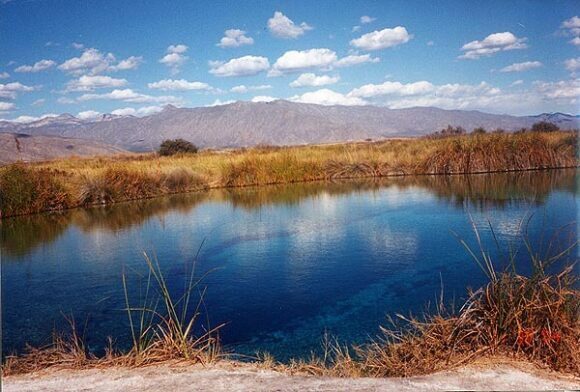 The wetlands are an integral part of the UNESCO-designated Cuatro Ciénegas biosphere reserve. The reserve is home to several endemic organisms, including microorganisms such as cyanobacteria that historically helped produce oxygen for the Earth’s atmosphere. The area is considered “a living laboratory of evolution and the origin of life”. Human activities in the surrounding area have led to severe water stress on the Cuatro Ciénegas marshes. The basin’s average natural recharge rate (replenishment rate) is about 25 million cubic meters a year, but the average yearly extraction rate, almost all for agricultural use, is close to 49 million cubic meters. Water stress may be exacerbated in coming years by climate change, which may reduce rainfall while simultaneously increasing evapotranspiration. Scientists have also identified five particular exotic (introduced) species that pose a significant risk to the long-term quality of the Cuatro Ciénegas wetlands. Whether naturally or deliberately introduced, these five species – African jewelfish, blue tilapia, giant cane (giant reed), Guatemalan fir and tamarisk (salt cedar) – threaten to displace endemic species and change natural nutrient flows and food chains. Guatemalan fir and tamarisk soak up water as they grow, further drying out the marshes (though, eventually, when little water is left, they will die off). The blue tilapia carries parasites that can jump to local species that have no resistance to them. The African jewelfish occupies the same ecological niche as the endemic mojarra and gradually replaces it. Mexico’s Comision Nacional de Áreas Naturales Protegidas (CONAMP), is now working with the Mexican Fund for Nature Conservation (FNCN) and the Canadian government agency Parks Canada to develop and implement a control and eradication program to tackle these five invasive species. The long-term survival of this highly unusual ecosystem may well depend on this program’s success. Mexico is one of the world’s wealthiest countries in terms of mangroves, with between 600,000 and 900,000 hectares of them in total. (For details about why this range of values is so large, see How fast are mangroves disappearing in Mexico?) To prevent further destruction Mexico enacted federal legislation in 2007 designed to protect existing mangroves. 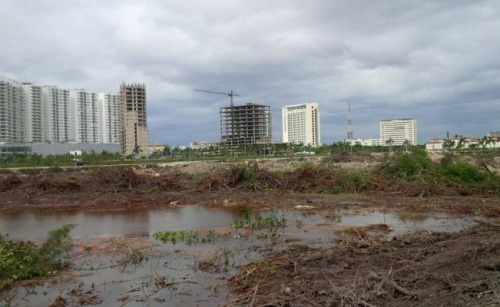 Despite this, news reports indicate that heavy equipment, protected by armed police, moved in to Malecón Tajamar on 16 January 2016 and proceeded to destroyed 57 hectares (140 acres) of mangroves overnight. This mangrove swamp had been under threat for some time, but the activist movement “Salvemos Manglar Tajamar” had gained considerable public support and managed to bring a temporary halt to further development work in the area. Greenpeace México alleges that Fonatur falsified environmental assessments, and even denied that any mangroves existed at Malecón Tajamar. According to Greenpeace, municipal, state and federal authorities colluded to ensure that the mangroves would be destroyed and that construction of the tourist complex could continue. Greenpeace México not only condemned the destruction of mangroves but called for an immediate halt to work in the area pending a full and open discussion with all stakeholders. They believe that the mangroves could possibly reestablish themselves in time if the area is left untouched. Work to infill the area cleared of mangroves has now been suspended while animal experts try to rescue, and relocate, as many of the animals who survived the initial disturbance as possible. In theory, Fonatur and the federal Environmental Secreatariat were obligated to ensure that developers had an adequate plan in place, prior to clearance, to relocate all animals, in line with the initial environmental impact report approved in 2005. Another NGO, Defensores del Manglar, has announced it will submit a formal complaint about recent events at Malecón Tajamar to the headquarters of the Ramsar Convention in Switzerland. The Ramsar Convention, to which Mexico is a signatory, is an international accord for the conservation and sustainable use of wetlands. Defensores del Manglar claims that Malecón Tajamar is protected under the Convention, even though the area does not appear to be specifically included on this list of Mexico’s 140+ Ramsar sites. Geo-Mexico joins with Greenpeace Mexico and Defensores del Manglar in deploring the destruction of Mexico’s remaining mangroves and will continue to publicize cases where developer greed results in irreversible environmental damage. 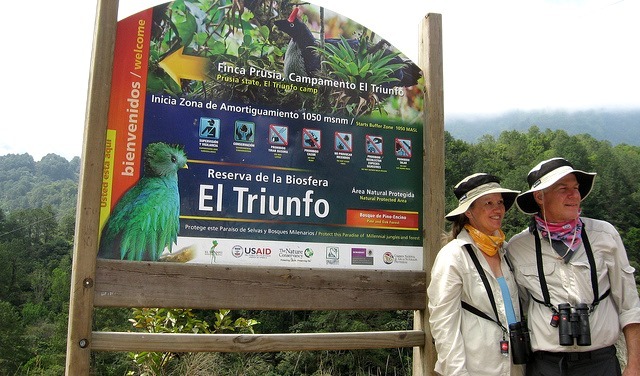 The El Triunfo Biosphere Reserve covers 119,177 hectares in the southern state of Chiapas, in the municipalities of Acacoyagua, Angel Albino Corzo, La Concordia, Mapastepec, Villa Corzo, Pijijiapan and Siltepec. The reserve ranges in elevation from 450 meters above sea level to 2550 meters (8370 ft). 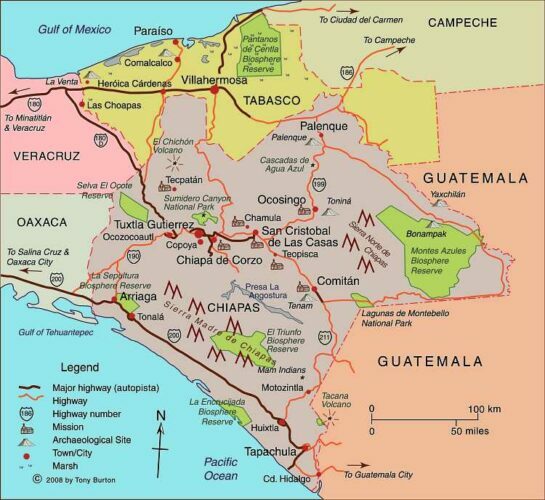 El Triunfo is part of the mountain range known as Sierra Madre de Chiapas in the southern part of the state. It straddles the continental drainage divide. Short rivers on one side flow to the Pacific Ocean. The rivers on the other side of the divide are the start of one branch of the mighty Grijalva-Usumacinta River (Mexico’s largest river in terms of discharge) which flows into the Gulf of Mexico. 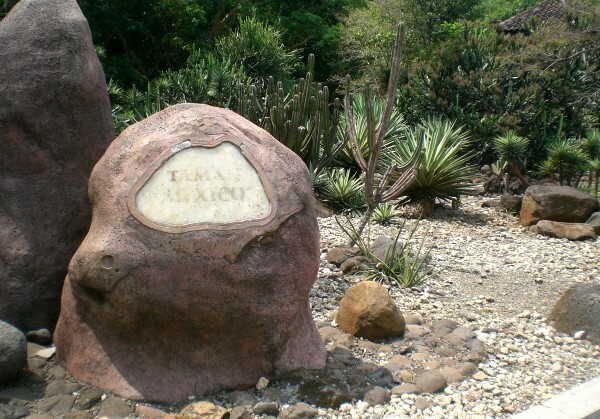 The El Triunfo reserve was first established in 1990. In 1993, it was officially designated a World Biosphere Reserve by the MAB-UNESCO program. 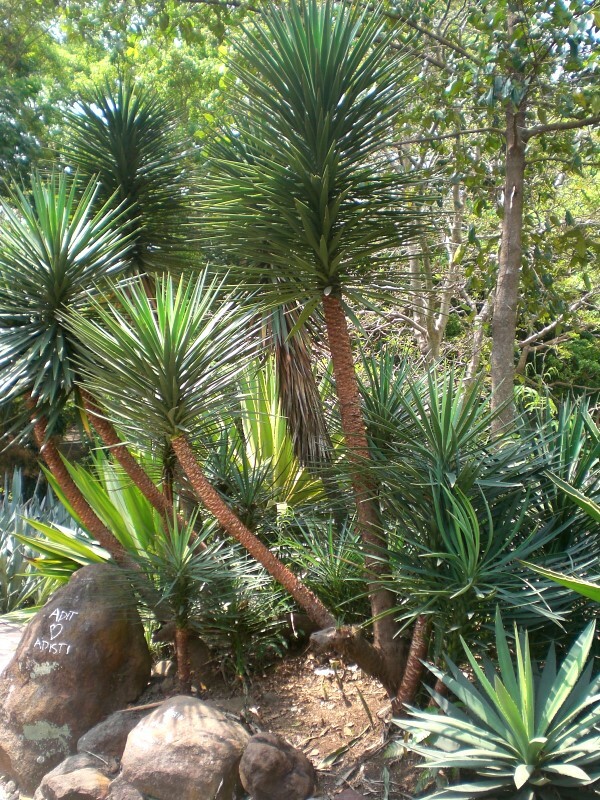 El Triunfo has numerous plants and animals. Its vegetation, representative of several distinct ecosystems, includes evergreen tropical humid forest; mountain rainforest; tropical deciduous rainforest; pine-oak forest; and evergreen cloud forest. 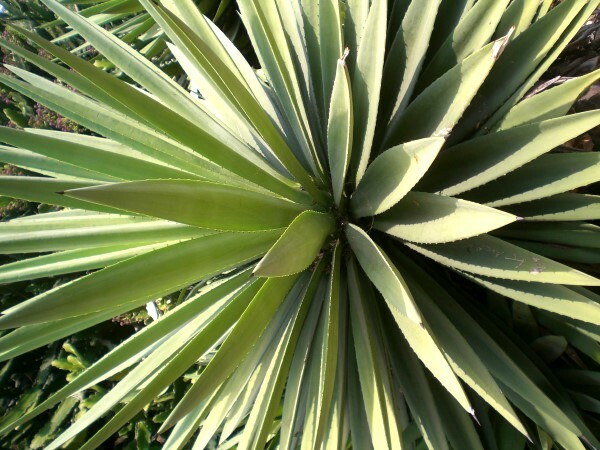 On Cerro Ovando alone, about 800 different species of plants have been recorded. Threatened mammalian species found in the reserve include Geoffroy’s spider monkey, margay, the tapir (Tapirus bairdii), jaguar (Panthera onca) and puma. Unfortunately, this means that this is a favored area for wildlife hunters, poachers and traffickers. The bird fauna is especially distinctive. The reserve is one of the relatively few places in Mexico where ornithologists have the chance to find the horned guan (Oreophasis derbianus), resplendent quetzal (Pharomachrus mocinno), cabanis’ tanager (Tangara cabanisi), azure-ramped tanager and great curassau. The resplendent quetzal is considered one of the most beautiful birds in the Americas, and its feathers were highly prized in pre-Columbian times. As is the case for other Biosphere Reserves, local people are allowed to live and work in the El Triunfo Reserve. The core area (25,719 hectares) is restricted to conservation and research only, but the buffer/transition areas (93,458 ha) are home to about 12,000 people. 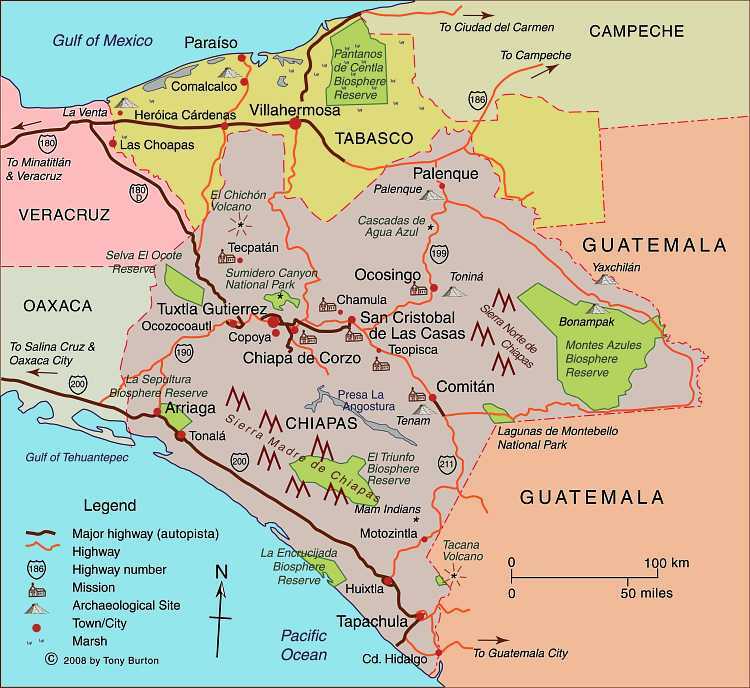 El Triunfo is also on the migration route of Guatemalan Indians entering Chiapas either to work (seasonally) on coffee plantations or as the first stage of their journey further north. This floating population is trickier to quantify. The area was important historically for the production and trade of items such as cacao, quetzal feathers, jade and copal resin. In the 17th century, the population grew rapidly in this region with the establishment of plantations, and later cattle ranches. Coffee was introduced at the end of the 19th century and quickly became the dominant cash crop for most small landowners. Environmental damage, mainly from clearance and cattle ranching, became a major problem, but it was not until the 1970s and pioneering work of Dr. Miguel Alvarez del Toro that any restrictions were placed on land use. Today, the main economic activities within the buffer areas of the reserve are agriculture (coffee, corn), the collection of Chamaedorea palms, trade, construction and cattle raising. Several NGOs are working with farmers in the buffer zone to improve their livelihoods and ensure that farming can be carried out sustainably and still support the existing population. For a lively introduction to this topic, try (Co-operative) Value Added on the blog Small Farmers. Big Change. As they say, “a green and more just food system starts with small farmers”. Alejandro del Mazo Maza, head of Mexico’s Commission for Protected Natural Areas (Áreas Naturales Protegidas), says that the formal decrees for seven additional PNAs (Protected Natural Areas) will be published shortly. In some cases, the decrees apply to areas whose status as protected areas was first announced months or even years ago. Mexico currently has 177 PNAs (in various categories), and the new additions bring that total to 184. In addition, preparatory studies are underway to establish two additional biosphere reserves, for the Mexican Caribbean and the Gulf of California (Sea of Cortés). For example, the management program for the whale shark reserve authorizes a maximum of 160 whale-watching boats in an effort to ensure sustainability. Visitors to the De Young Museum in San Francisco can admire a wonderful mural showing the fauna and flora of the Pacific, painted by Mexican artist José Miguel Covarrubias (1904-1957) for the city’s 1939-1940 Golden Gate International Exposition on Treasure Island in San Francisco Bay. Following conservation work performed by experts in Mexico, the mural is currently on loan to the De Young Museum from its owners, San Francisco’s Treasure Island Development Authority. While the De Young Museum website continues to describe this mural as “one of a six-part series of fanciful, larger-than-life-size maps created by noted Mexican artist Miguel Covarrubias”, we sincerely doubt that these murals were ever really “larger-than-life-size”! The mural is one of the five remaining murals painted by José Miguel Covarrubias for the exposition. The whereabouts of a sixth mural, which completed the series known as “Pageant of the Pacific”, are unknown. The details are exquisitely painted, and the mural is as beautiful as it is educational. Covarrubias was indeed a geographer and ethnologist. Among other works, he authored Island of Bali (1937); Mexico South (1946); The Eagle, the Jaguar, and the Serpent – Indian Art of the Americas; North America: Alaska, Canada, the United States (1954); and Indian Art of Mexico and Central America (1957). The temporary structures on Treasure Island were subsequently demolished and Covarrubias’ six murals sent to the American Museum of Natural History in New York. 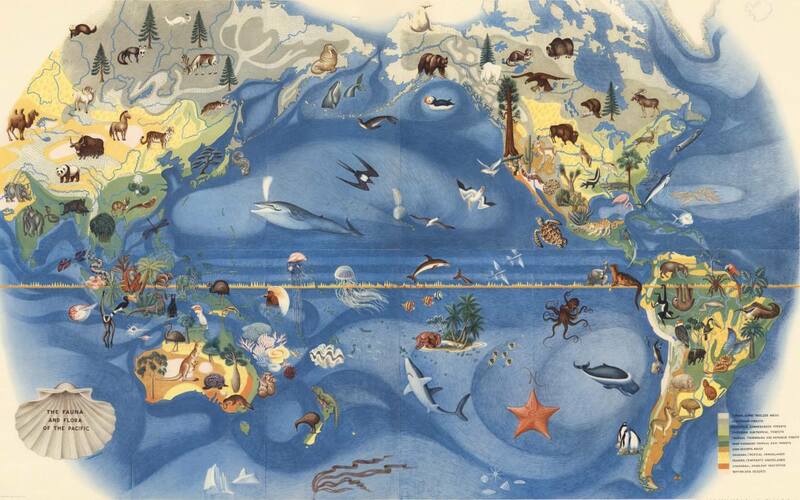 When they were brought back to California in the late 1950s, the series was missing the mural entitled “Art Forms of the Pacific Area”. 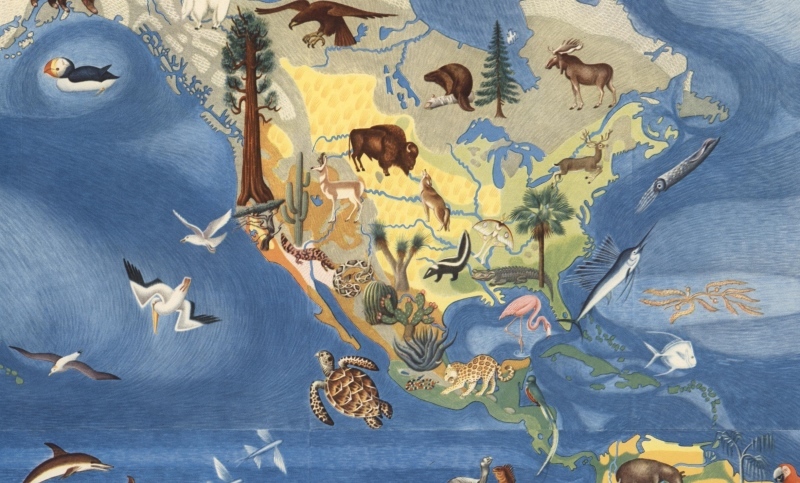 The titles of the five surviving murals are The Fauna and Flora of the Pacific, Peoples, Economy, Native Dwellings, and Native Means of Transportation. The U.K. has declared 2015 as the “Year of Mexico” and is hosting numerous cultural and trade events this year related to Mexico. Not to be outdone, a Mexican-themed Pavilion exhibit has won gold at the prestigious Chelsea Flower Show, held in London in May. 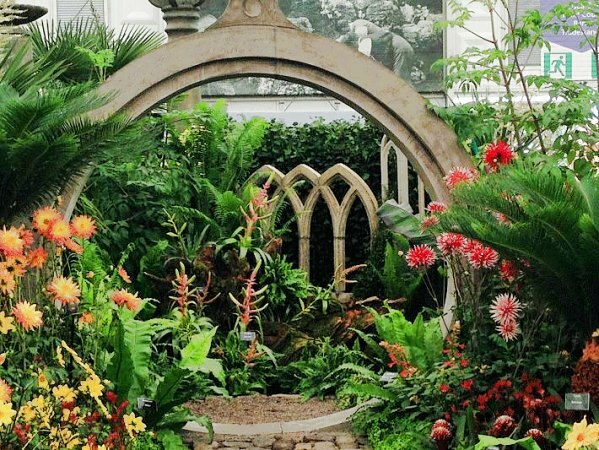 The show is organized each year by the Royal Horticulture Society and was first held more than a century ago. The gold-medal winning garden design in 2015 was based on a very unusual garden created in Mexico by the eccentric Englishman Edward James at “Las Pozas” (the Pools), the home he built near Xilitla in the state of San Luis Potosí. James (1907-1984) was a sponsor of the surrealist art movement, as well as a surrealist artist in his own right. His entire estate in Mexico became his canvass for a marvelously-creative collection of sculptures and follies set in luxuriant, semi-tropical jungle. “Surreal Pillars of Mexico” had a circular structure and pillars that emulated Edward James’s garden in Mexico. It included 50 different types of dahlias, surrounded by over 100 plants and vegetables such as lettuce, cactus and the exotic agave plant. New varieties of dahlias, first described in Mexico in 1529, had been developed via selective breeding and propagation programs even in pre-Columbian botanical gardens. The dahlia arrived in the U.K. in the early nineteenth century, via Spain and only after several unsuccessful attempts at introducing it. The National Dahlia Collection in the U.K. cultivates and promotes the flower; all the varieties existing in the U.K. originated from just three types of dahlias. The Year of Mexico to the United Kingdom includes more than 100 separate exhibitions, concerts, festivals, academic workshops and artistic residencies; as well as trade missions, research projects, grants and scholarships. These shows will highlight the creativity of Mexican writers and artists, while also showcasing the country’s history and its modern-day industrial strength.Events are being held at a number of cities, including London, Cardiff, Edinburgh, Belfast, Manchester, Oxford, Liverpool and Birmingham. Like many geographers, I have long held a more than passing interest in botanical gardens. 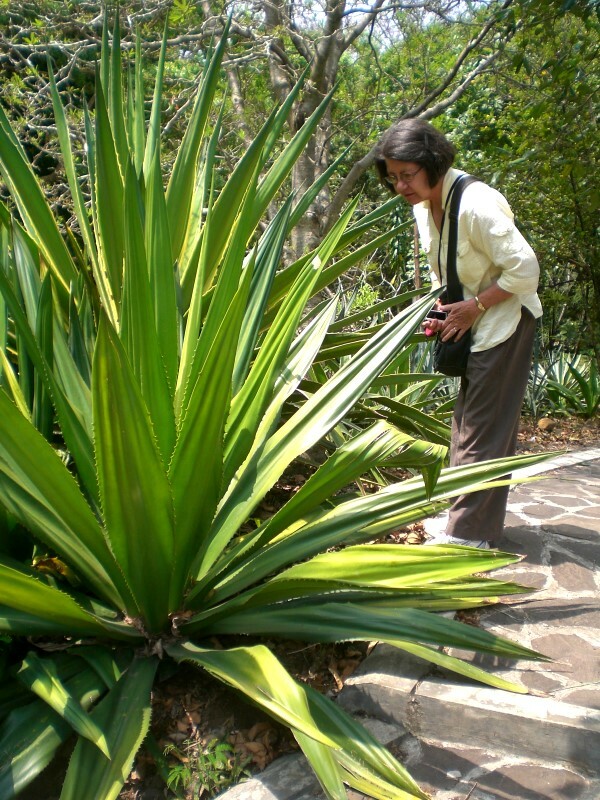 From a geographic standpoint, botanical gardens offer the chance to closely examine plants that can be very difficult, virtually impossible, to find in the wild. 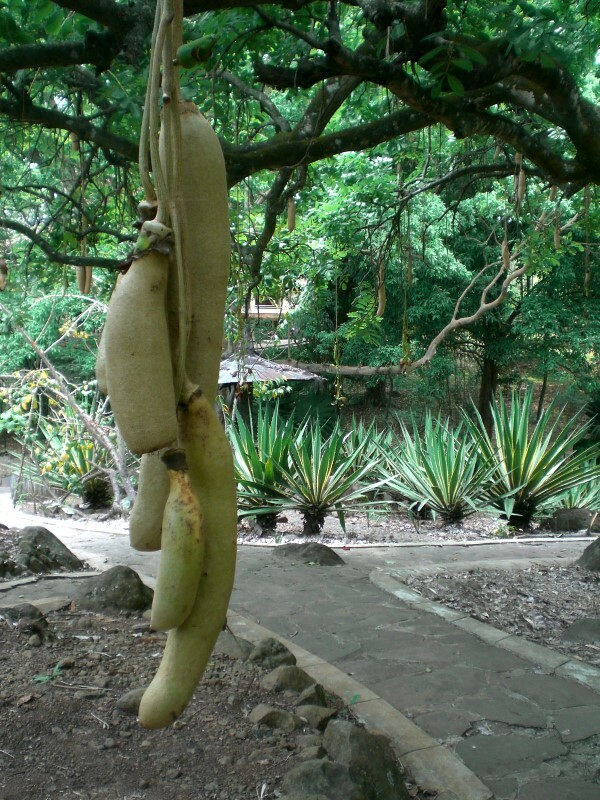 Many botanical gardens display the typical plant assemblages that are common in the local region, while also giving a plant-based snapshot of different environments elsewhere. Mexico has an extraordinary variety of flowering plants, estimated (even twenty years ago) to include more than 20,000 different species. 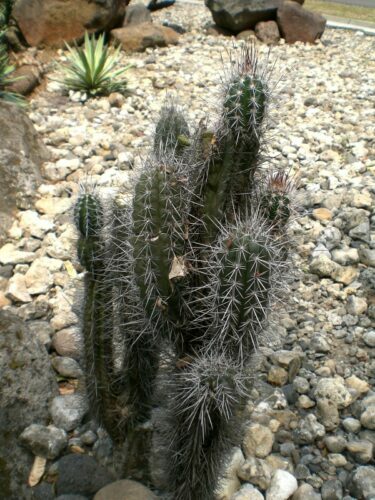 Many garden plants commonly planted in Europe, the USA and elsewhere originated in Mexico. 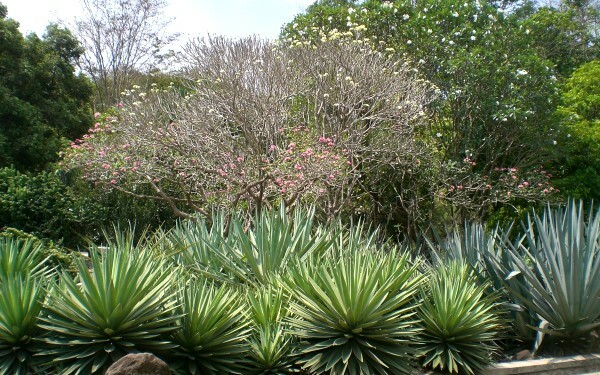 Over the years I’ve looked at Mexican cacti and succulents in numerous botanical gardens around the world, but was pleasantly surprised when visiting Indonesia in 2013 to discover that the Purwodadi Botanic Garden in Pasuruan, East Java, actually has an entire section devoted to the Mexican flora characteristic of semi-arid conditions (see photos). The 85-hectare Botanic Garden was first established in 1941, and has plants collected from a wide range of areas in Indonesia, as well as smaller sections devoted to plants from elsewhere. I’m not sure how old the Mexican section is, but the plants are clearly thriving, despite showing some signs of neglect. This is mainly because the climate in the Botanic Garden (located at 8 degrees south of the equator and longitude 113 degrees east) is fairly similar to some parts of Mexico. The Garden has an elevation of 300 meters and an annual rainfall of 2366 mm. Assuming that the Mexican Embassy in Jakarta had some part in establishing this fine display of Mexican flora, perhaps it is time that embassy officials revisit their gift and see whether they can’t enhance the Mexican garden by sponsoring some information signs, so that visitors can truly appreciate these venerable plants, not only for their beauty, but also for their ecological and economic significance. 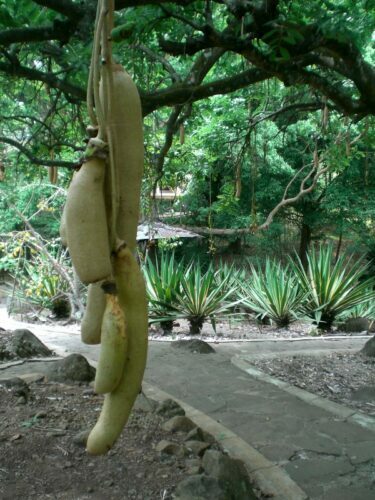 There are lots of additional botanical goodies to be seen here in addition to the Mexican Park, including stately jacaranda trees and an amazing collection of banana plants. The Purwodadi Botanic Gardens are well worth a visit if you ever happen to be anywhere in the vicinity. They are located about 70 kilometers south of the city of Surabaya towards Malang. Allow at least 90 minutes for the drive. Photos by Tony Burton; all rights reserved. ﻿How fast are mangroves disappearing in Mexico? 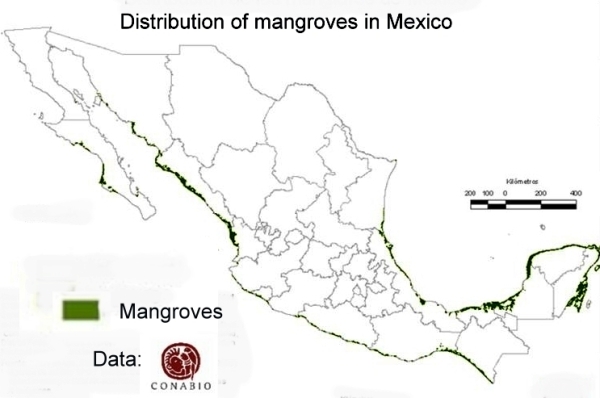 Updates to Geo-Mexico Comments Off on ﻿How fast are mangroves disappearing in Mexico? It is surprisingly difficult to give a single, definitive response to this seemingly simple question, so in 2008, Arturo Ruiz-Luna and a group of researchers set out to answer the question once and for all, by taking a close look at the available data and its reliability. The first challenge is to define precisely what counts as “an area of mangroves”. Since the edges of any one type of vegetation tend to merge gradually into the next, the boundaries between types are often not clear or discrete. The second challenge is to find comparable maps or records of the extent of mangroves in former times. In many cases, earlier maps were based on simple aerial photography as opposed to the more sophisticated satellite imagery available today. Equally, studies relying on different technology may produce quite different results. Ruiz-Luna and his colleagues concluded that there was a high degree of uncertainty over the true extent of mangrove cover in Mexico and over the rates of mangrove depletion. The unreliability stemmed from the very different estimates of mangrove cover given in earlier studies. They found that the earliest estimate of the extent of mangroves in Mexico, made in 1973, was 700,000 ha (1.7 million acres). From 1980-1991, a figure of 660,000 ha was widely quoted. This is thought to have been derived from the previous figure using a linear regression to include estimated deforestation rates. On the other hand, a study in 1992, based on 1:3,800,000 scale maps, arrived at an areal extent of 932,800 ha. A 1993 government estimate, based on satellite imagery and supporting ground survey, came up with a figure of 721,554 ha. A 1994 estimate, also using satellite data, arrived at a similar figure. Since 2000, estimates vary from a low of 440,000 ha (based on deforestation rates and linear regression) to a high of 955,866 (almost all of it mangrove, with a small area of secondary mangrove succession). According to Ruiz-Luna and his co-authors, it is therefore likely that the true value of the extent of mangroves lies somewhere between 600,000 and 900,000 ha, with the authors plumping for 800,000 ha as a reasonable estimate. The loss of mangroves can also result from changes to hydrological systems on the landward side of the mangroves. For example, when an artificial channel was opened in the 1970s in Cuautla (Nayarit) to connect the Marismas Nacionales with the sea, the channel was originally about 50m wide. It is now about 600m wide in the middle, and more than 1000m wide at its mouth, due to damage caused by the river flow, and from the greater exposure of mangroves to higher salinity water, as well as increased mangrove mortality from storms and hurricanes. While there are some small-scale projects to replant mangroves in some tourist area, this is unlikely to be a good substitute for the original mature mangrove ecosystem. 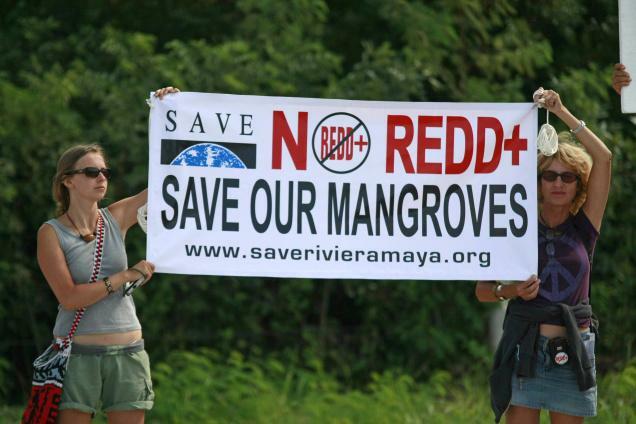 This is why Geo-Mexico is happy to help publicize public protests against mangrove destruction, such as the one pictured above which took place at the Cancún climate summit in 2010. Arturo Ruiz-Luna, Joanna Acosta-Velázquez, César A. Berlanga-Robles. 2008. “On the reliability of the data of the extent of mangroves: A case study in Mexico.” Ocean and Coastal Management 51 (2008) 342-351. 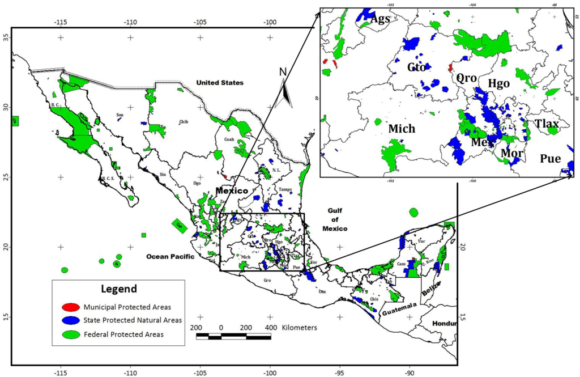 Updates to Geo-Mexico Comments Off on Where are Mexico’s mangrove swamps? 25 on the Yucatán Peninsula. A national inventory has now been compiled by CONABIO. All areas have been surveyed and preliminary descriptions published including details of their location, size, physical characteristics, socioeconomic conditions, local uses of mangrove, biological details, including vegetation structure, and an assessment of local impacts and risks, management and existing conservation measures. The areas of mangroves have been mapped at a scale of 1:50,000 and satellite photos from 2005-2006 have been used in conjunction with fieldwork to calculate the areas of mangroves. The final map is believed to be more than 90% accurate, a reasonable baseline for future comparisons. CONABIO is planning to resurvey the mangrove areas every 5 years following the same methodology. According to preliminary comparisons with previous attempts to quantify the extent of mangroves in Mexico (the subject of a future post), the loss of mangroves was greatest in the period 1970-1980, and in 2000-2005, but then diminished in the period 2005-2010. Between 2005 and 2010, the states where mangrove loss remained high (as a percentage of the total area of mangroves in the state) included Chiapas, Baja Californa Sur and Sonora. However, the states losing the largest areas of mangroves in absolute terms were Quintana Roo, Campeche and Nayarit. Jalisco has the unfortunate distinction of being the state where coastal mangrove loss was highest (in terms of the proportion of its total coastline length bordered by mangroves).